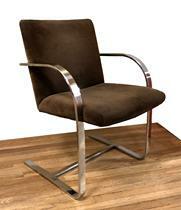 Modern Armchairs --- high polish stainless steel frame with newly upholstered seat. These are a very nice set of flat bar high polish stainless steel armchairs, showing significant homage to Mies van der Rohe. The chairs are full size, of high end manufacture. Quite heavy and quite comfortable. Condition is very good to excellent. There are no meaningful scratches or scrapes to the frames, showing only the slightest wear at the base. Particularly bright high polish stainless frames, showing no oxidation to the metal.